1000 Books Before Kindergarten Bags are Here! We are very excited to announce the arrival of 1000 Books Before Kindergarten bags! 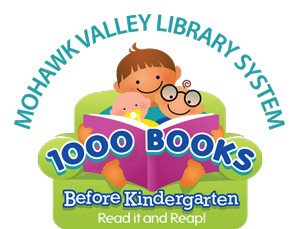 1000 Books Before Kindergarten is a program that encourages all families and caregivers to read 1000 books with their young children before they enter kindergarten. Borrow a bag, read with your child, and track your progress! Studies have shown that families who start reading aloud to their children at birth help to strengthen their language skills and build their vocabulary – two important tools for beginning to learn to read. Each bag contains 10 books, suitable for most 3-5 year olds (and coming soon – Baby Bags, with 5 books suitable for little ones from birth-age 2.) Bags are available for borrowing at all MVLS libraries in Fulton, Montgomery, and Schoharie Counties.